At the sight of the new brewer box with the matching 0.33l bottle in the “Euro style”, the answer to the question is difficult. Is this another project that follows the retro trend and has expanded the division by an additional package, or has created a completely independent style of design. The new box in connection with the fitting bottles was realized as a joint project by DELBROUCK and our partner EUROGLAS. 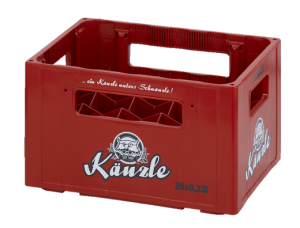 The first new customers, which successfully introduced the new container, are the breweries Kauzen Bräu GmbH & Co. KG Ochsenfurt and Kaiser-Brauerei Geislingen / Steige. The new combination is ideal for the presentation of special or seasonal specialties. For further information, please contact our sales team.